Sunday Quote!- A Disconnect Between Parchment and Pew? | J.W. Wartick -"Always Have a Reason"
Sunday Quote!- A Disconnect Between Parchment and Pew? A Disconnect Between Parchment and Pew? I wonder sometimes about this very disconnect. The average person in the pew is unfamiliar with and unaffected by things like the Kalam Cosmological Argument or the subtle distinctions required to discuss the problem of evil. Rather, they are more concerned with the practical aspects of faith and the amount of work needed to explain these arguments is neither required nor desired. There does exist this disconnect between parchment–the philosophical theories–and the pew–the average Christian. What can we do to bridge this gap? What does this say about the epistemic validity of faith generally? Is this even an area for concern at all? I don’t think there are easy answers to these questions. Interestingly, Jordan went on to suggest that one way to bridge the disconnect was with pragmatic arguments, such as Pascal’s Wager. It will be interesting to see how he develops that thesis, and how he defends such arguments. I eagerly look forward to continuing my read of the book. 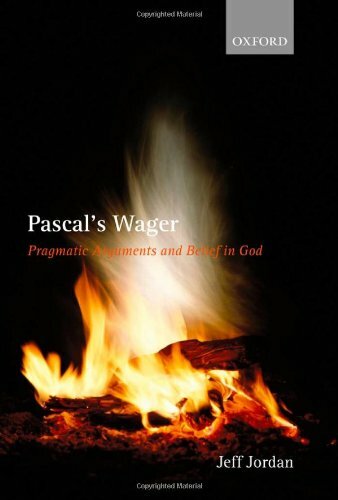 Jeff Jordan, Pascal’s Wager: Pragmatic Arguments and Belief in God (New York: Oxford, 2006). « Really Recommended Posts 3/14/14- “Cosmos,” The Monuments Men, C.S. Lewis, and more! This is brilliant. I would love to see more average Christians become more rounded in their faith by studying things like philosophy/apologetics. God uses these things with His grace to help carry you through a season of doubt and silence. Gotta pick up this book. Sounds wonderful. Be aware that the book itself is a pretty intense study of epistemology and related issues. Jordan thinks the argument is useful for laity but this book is written to defend the argument (and others like it) analytically. While we obviously disagree on many topics (since I am a progressive Christian), I do also view a need to seriously and honestly reflect about faith and the arguments for and against it. This has led me (along with many other people) to view faith as hope in the face of insufficient evidence. I think that neither arguments for Christianity nor for atheism are ultimately compelling since all of them depend on some unprovable postulates. Of course, if it were shown that Jesus did not rise from the dead (or that humans are determined biological machines), we ought to cease being Christians. But if it has not, it it (to my mind) permissible to hope it is true even if you cannot know it. I know you are probably going to strongly disagree with me on that issues. Friendly greetings from a true European currently living in Britain. Is not that statement itself an unprovable postulate? Well I am not dogmatic about that. All arguments I have read until now are unconvincing.